LNWC prebuilt four types of birdhouses (bluebird, flycatcher, nuthatch, wren) then unassembled these, creating kits with wood, screws, hinges, assembly instructions for children aged 6 -12. 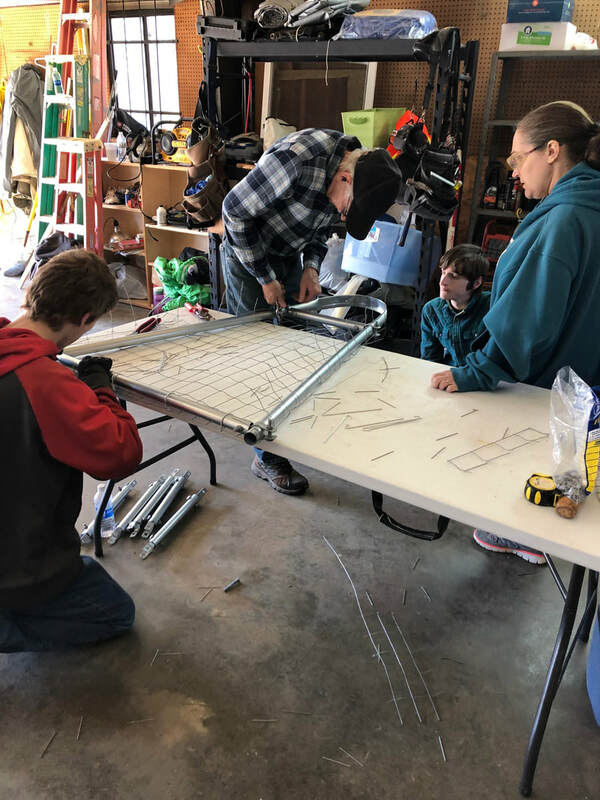 The kits were reassembled by the children with adult supervision at the Lake Norman Volunteer Fire Station, where a naturalist gave a viewgraph presentation on cavity nesting birds. The participants took home their birdhouses and information sheets. 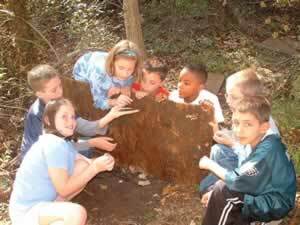 We have held two bird house builds and supervised several others, usually with scout troops. LNWC designed and continues to build (with permission of NCWF and Duke Energy on a periodic basis) metal nesting platforms for osprey, seeding these with nest materials, and then installing them on wooden and/or metal poles in various locations around Lake Norman, Lake Wylie, and Mountain Island Lake. Ospreys have been spotted using the nests within two days of installation. The same pair of ospreys can return annually to their respective nests to raise their broods. 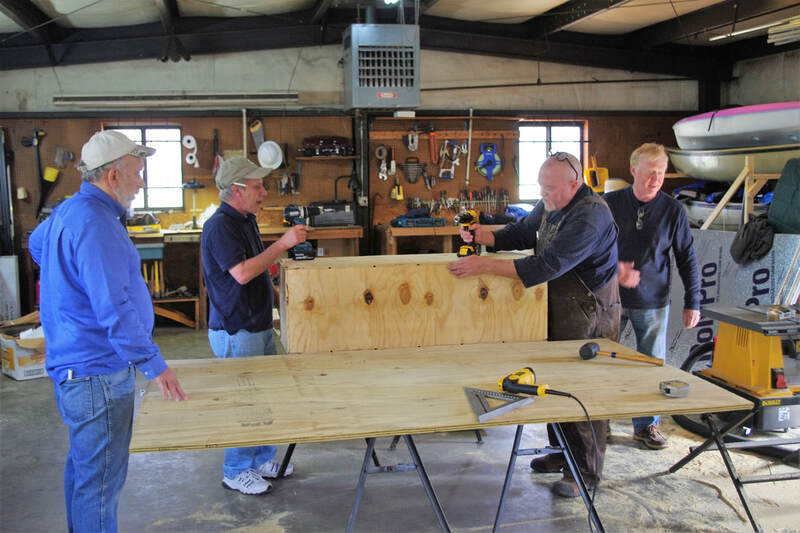 LNWC volunteers built 19 cedar wood platforms using a design from a similar turtle program in Pennsylvania. These platforms provide a habitat area which is lacking as lakefront areas are cleared of dead trees along the shorelines by home builders. The platforms are heavily used by turtles and shorebirds, alike. 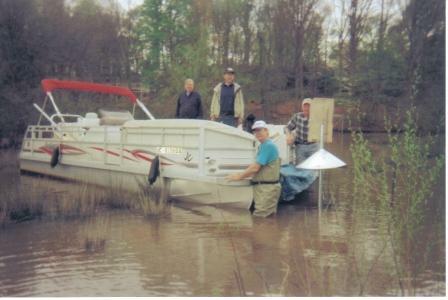 One was also built and installed in the lake of a Mooresville senior citizen community in 2012. 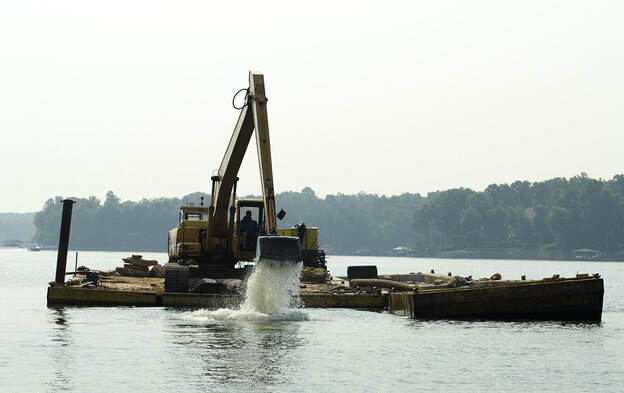 Two years ago, using Duke Energy Catawba-Wateree Habitat Enhancement Program funds, NCWF and LNWC created the sixth rock reef on Lake Norman using 120 tons of boulders. Today, the reef is teaming with various species of fish and aquatic vegetation. Here's a video giving you an up-close look at life in a reef..30ft underwater, and another previously posted video of that particular reef being created. 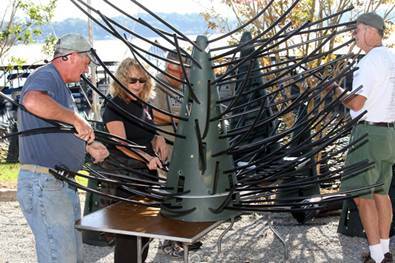 At the first event, LNWC purchased 200 fish attractors and submerged these at 20-ft or more in various locations around the lake. Within minutes after the attractors were submerged there was a significant increase in the number of fish. This project is conducted periodically through our state organization, the NC Wildlife Federation with permission from Duke Power, owner of Lake Norman. LNWC helped Mid-Atlantic Mitigation LLC create a 15.5-acre wetland habitat bordering Reed's Creek by installing and maintaining nesting boxes for wood ducks, warblers, barred owls and blue birds, and planting trees. 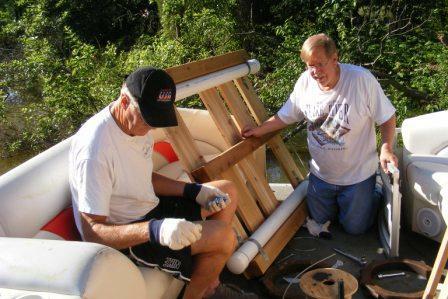 LNWC volunteers routinely pick up trash along Reed’s Creek and the wetland, and continue oversight of the property, now owned and managed by the state of NC. 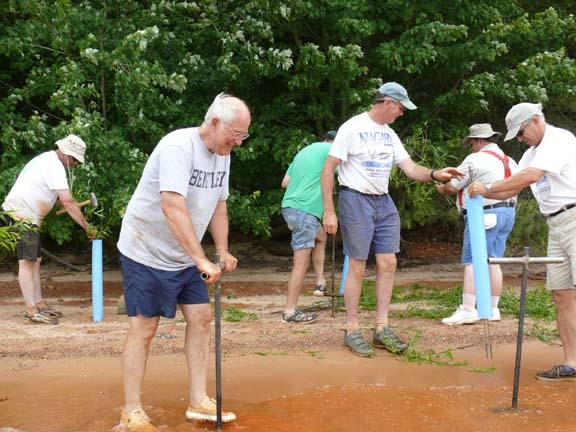 LNWC volunteers led a successful effort to certify as a Community Wildlife Habitat the entire Lake Norman Region, including all the communities around the lake. This was the first lake region so certified by the National Wildlife Federation. Our chapter continues to encourage residents/businesses/churches/schools/libraries/parks to have their properties certified as Wildlife Habitats using the criteria of the NWF (food, water, cover, places to raise young). This is a requirement of our community certification. 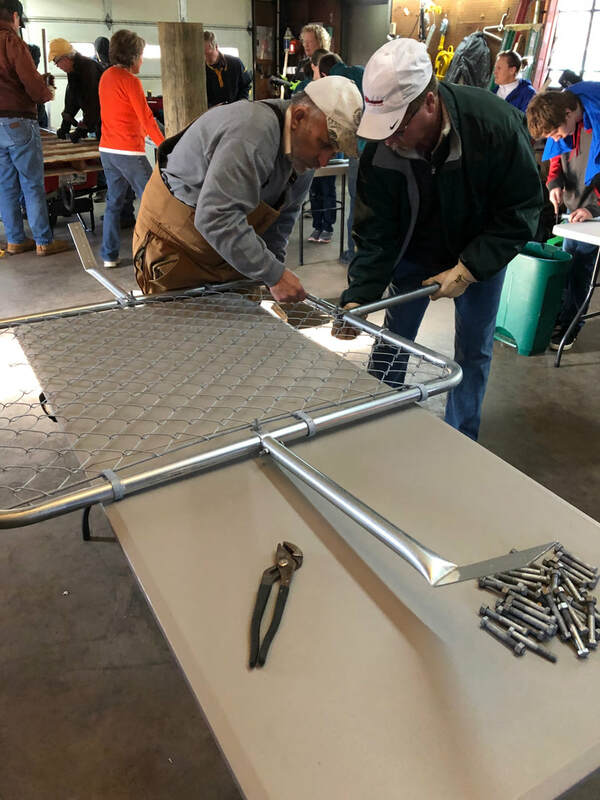 LNWC Hunters Offering Other's Food Program brings together farmers, sportsmen and community groups to sustainably manage white-tailed deer, reduce deer damage to crops, increase local farm and community revenue and provide hunter-harvested venison to local food banks and shelters. Great Blue Herons (Ardea herodiusare) are losing their nesting habitats around Lake Norman due to development and lake erosion. In 2012 to help maintain their populations, LNWC started building and installing Heron platforms that would both enhance existing and establish new heron rookeries. LNWC set up 72 coverboards to inventory and monitor reptiles and amphibians (herps) on 12 islands in Lake Norman and at Reed’s Creek. Coverboards are sheets of plywood that are laid on the ground to provide an attractive shelter for these species. The boards are lifted periodically and the species that have crawled underneath are surveyed, recorded, and photographed if possible. The data collected was provided to Davidson College’s Department of Biology. It was determined that since nothing significant was found under the boards during the research period, the study was discontinued and LNWC’s Island Habitat participants will remove the coverboards as part of their cleanup work. LNWC volunteers, with permission from Duke and in cooperation with NCWF, have planted black willows, water willows, button bushes and other plant materials on the shorelines of several islands in Lake Norman. LNWC entered into an agreement with the Town of Cornelius to help develop a new nature preserve as a wildlife habitat. The preserve will include a Butterfly Garden, handicap-accessible walking trail, cavity nesting boxes, and display signage. LNWC volunteers are helping protect pond turtles while their pond is being renovated by erecting silt fencing (Spring, 2014). An Earth Day Planting Project took place April 26, 2014 for the Butterfly Garden. 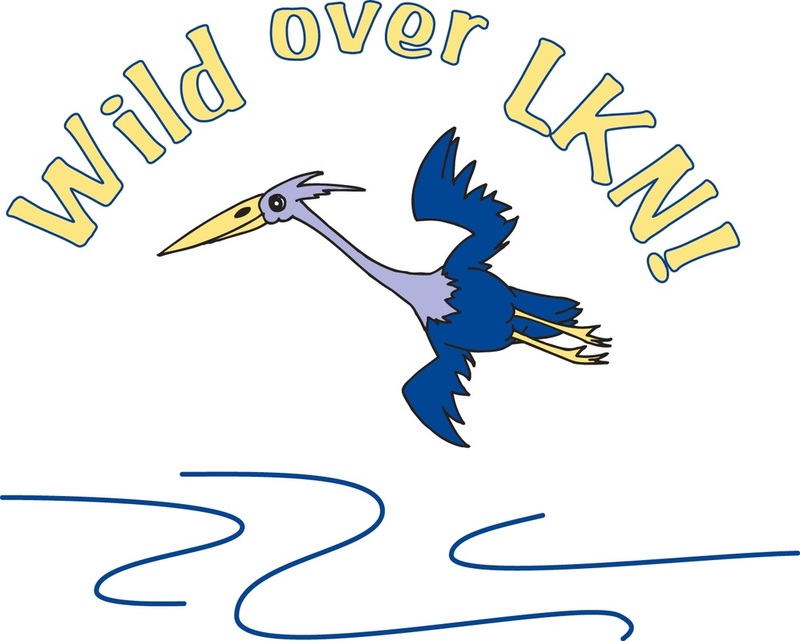 LNWC volunteers conduct nature walks and monitor the preserve on an ongoing basis. Chimney Swifts (Chaetura pelagica) are in steep decline, and building a nesting tower to replace chimneys that are disappearing quickly in North Carolina due to capping or removal is an important way to help this special bird. 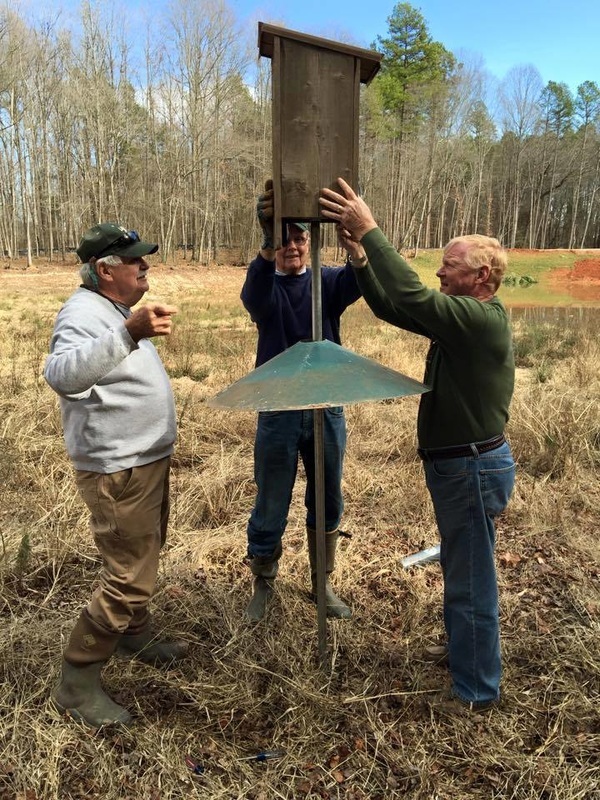 In 2019 LNWC started our Chimney Swift Tower program by building three 12 foot towers which will be installed at three different locations around Lake Norman.